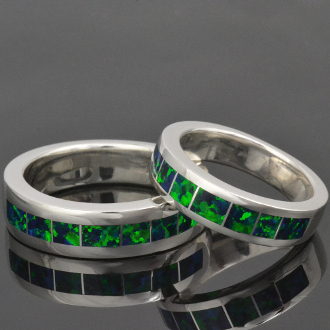 This matching his and hers wedding ring set features lab created opal inlaid in sterling silver. The lab created opal in this wedding set has bright green flashes on a dark blue base color. The color and pattern of this lab created opal rivals that of the finest Australian black opal. Lab created opal has the same chemical composition as natural opal with the exception of water content. Australian opal contains about 4% water and lab created opal contains no water. Instead, the water is replaced with resin. The resin gives the synthetic opal more durability and helps to resist cracking. Laboratory grown opal gives you all the fire and colors of top grade natural opal at a much more affordable price with increased durability. I have many color choices available in lab created opal. The man's wedding ring is 6.5mm wide at the top and is shown in a size 11 1/4 for scale. It is inlaid with 7 pieces of lab created opal separated by thin silver dividers. It is stamped .925 sterling silver and hand signed "MMH" inside the ring. The man's band is available at the price shown in sizes up to 11. Sizes larger than 11 will be an additional charge. The man's band is also sold separately if you do not need a set. The woman's wedding ring is 5.5mm wide at the top and is shown in a size 7 for scale. It is inlaid with 7 pieces of lab created opal to match the man's opal band. It is stamped .925 sterling silver and is hand signed "MMH" by Mark McBride Hileman. The woman's band is sold separately if you don't need a matching set. The price shown is for women's ring sizes up to 8. Women's sizes larger than 8 will be an additional charge. See my large size listing under "Metal Upgrades and Custom" section of my shop. This lab opal wedding ring set is shown in a his and hers combination but is also available in his and his or hers and hers set combinations as well. His and his will be a little more and hers and hers will be a little less. Contact me for a price quote in your ring sizes. This ring set is shown in standard sterling silver. The set is also available in tarnish resistant Continuum sterling silver, stainless steel, 14 karat gold and platinum for an additional charge. I will need your ring sizes for an accurate price quote.